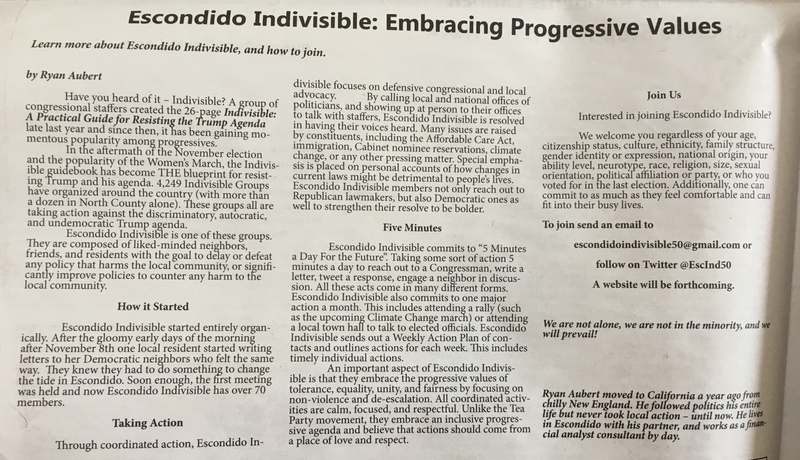 Escondido Indivisible is a grassroots group dedicated to affecting changes in our local community. We strive to take peaceful and focused actions to guard our democracy, and we rise together, indivisible, to actively resist President Trump’s autocratic, discriminatory and radical agenda. We welcome anyone who is willing to stand against authoritarianism and to resist efforts to dismantle our civil liberties, democratic institutions, and social and environmental protections. We can be found at the accounts below. Note that for all our communications, linking or re-posting does not equal endorsement.